Edward Ross Roybal was one of 10 children born to Baudilio Roybal, a carpenter, and Eloisa (Tafoya) Roybal on February 10, 1916, in Albuquerque, New Mexico.2 Like many families in the Southwest, Roybal’s family had lived in the region for eight generations, since it was controlled by the Spanish. When he was six, Edward and his family moved to Los Angeles, California, settling on the east side in the barrios near Boyle Heights. He attended the local public schools and graduated from Roosevelt High School in 1934. For much of the next year, he worked for the Civilian Conservation Corps before studying accounting and business administration at the University of California, Los Angeles, and Southwestern University, also in the city. From 1942 until 1944 he worked as a public-health educator with the California Tuberculosis Association, and he later served four years as director of health education for the Los Angeles County Tuberculosis and Health Association.3 Late in the Second World War, Roybal served as an accountant for an infantry unit in the U.S. Army. He married the former Lucille Beserra on September 27, 1940, and the couple raised three children: Lucille; Lillian; and Edward, Jr.
Like many veterans, particularly Latino veterans, Roybal was motivated by his wartime experience to challenge discrimination in Southern California, especially its effects on economic, education, and housing conditions around Los Angeles.4 After an unsuccessful bid in 1947 for a seat on the Los Angeles city council, Roybal helped start the Community Service Organization (CSO), which sought to ally the city’s diverse neighborhoods, using strategies outlined by noted reformer Saul Alinsky. Roybal was the group’s first president and its primary spokesman, and in addition to pushing an array of progressive issues, the CSO quickly became the core of Roybal’s political base.5 Two years later, at Alinsky’s urging, and with the support of local labor unions and, eventually, several newspapers, Roybal mounted a second attempt for a city council seat. 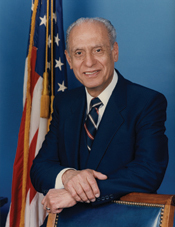 As a freshman at the start the 88th Congress (1963–1965), Roybal hoped to serve on the Foreign Affairs Committee because of his interest in U.S.-Latin American policy, but instead he was assigned to the Interior and Insular Affairs Committee and later to the Post Office and Civil Service Committee.22 In two years he won a seat on Foreign Affairs and left his previous assignments. After serving on the Veterans’ Affairs Committee in the 91st Congress (1969–1971), Roybal relinquished the Foreign Affairs and the Veterans’ Affairs assignments in 1971 for a seat on the exclusive Appropriations Committee. By the time he retired two decades later, Roybal had become chairman of the Appropriations Committee’s Subcommittee on Treasury, Postal Service, and General Government. He was also a longtime member of the House Select Committee on Aging, which he chaired from 1983 to 1993 (98th–102nd Congresses). Called “a model of dignity” by the Los Angeles Times, Roybal announced his retirement in 1992.59 Redistricting that resulted from the 1990 Census had severed his traditional power base in East Los Angeles. That fall, his daughter Lucille Roybal-Allard won election to the House as a Democrat from a new district that included constituents who had once been her father’s. 1George Ramos, “Edward R. Roybal, 1916–2005: Pioneer in Latino Politics in Los Angeles,” 26 October 2005, Los Angeles Times: A1. 2Names and occupations from Ramos, “Edward R. Roybal, 1916–2005: Pioneer in Latino Politics in Los Angeles”; and The Dictionary of Hispanic Biography (Gale, 1998). See also Katherine Underwood, “Pioneering Minority Representation: Edward Roybal and the Los Angeles City Council, 1949–1962,” Pacific Historical Review 66 (August 1997): 404. 3Matt S. Meier, Mexican American Biographies: A Historical Dictionary, 1836–1987 (Westport, CT: Greenwood Press, 1988): 199–200; Biographical Directory of the United States Congress, “Edward Ross Roybal,” http://bioguide.congress.gov. See also Sanford D. Horwitt, Let Them Call Me Rebel: Saul Alinsky—His Life and Legacy (New York: Alfred A. Knopf, 1989): 227. 4Ricardo Romo, East Los Angeles: History of a Barrio (Austin: University of Texas Press, 1983): 167–168; Edward J. Escobar, “Bloody Christmas and the Irony of Police Professionalism: The Los Angeles Police Department, Mexican Americans, and Police Reform in the 1950s,” Pacific Historical Review 72 (May 2003): 181. 5For more on this partnership, the CSO, and the 1949 city council election, see George J. Sánchez, “‘What’s Good for Boyle Heights Is Good for the Jews’: Creating Multiracialism on the East Side during the 1950s,” American Quarterly 56 (September 2004): 633–661; Horwitt, Let Them Call Me Rebel: 227–235; Kenneth C. Burt, “The Power of a Mobilized Citizenry and Coalition Politics: The 1949 Election of Edward R. Roybal to the Los Angeles City Council,” Southern California Quarterly 85 (Winter, 2003): 413–438; and especially Katherine Underwood, “Process and Politics: Multiracial Electoral Coalition Building and Representation in Los Angeles’ Ninth District, 1949–1962,” (Ph.D. diss., University of California–San Diego, 1992): 96–114. 6Ramos, “Edward R. Roybal, 1916–2005: Pioneer in Latino Politics in Los Angeles”; Matt S. Meier et al., Notable Latino Americans: A Biographical Dictionary (Westport, CT: Greenwood Press, 1997): 343; Romo, East Los Angeles: History of a Barrio: 169. 7Terms on the city council were lengthened to four years in 1953. See Underwood, “Pioneering Minority Representation”: 410–412. 8Quoted in Ramos, “Edward Roybal, 1916–2005: Pioneer in Latino Politics in Los Angeles.” A similar version of this incident is included in “Roybal Recalls Prejudice inside Council, Congress,” 27 July 1987, Los Angeles Times: 8. 10For an in-depth examination of the city council’s makeup and Roybal’s initiatives, see Underwood, “Process and Politics: Multiracial Electoral Coalition Building and Representation in Los Angeles’ Ninth District, 1949–1962”: 154–248. See also Irasema Coronado, “Roybal, Edward,” in the Oxford Encyclopedia of Latinos and Latinas in the United States Vol. 4 (New York: Oxford University Press, 2005): 40; Ralph Nader Congress Project, Citizens Look at Congress: Edward R. Roybal, Democratic Representative from California (Washington, D.C.: Grossman Publishers, 1972): 12; “Chairmen of 15 Council Committees Announced,” 7 July 1949, Los Angeles Times: A1. 12See, for example, Underwood, “Process and Politics: Multiracial Electoral Coalition Building and Representation in Los Angeles’ Ninth District, 1949–1962”: 165–167, 209–215. For a shorter treatment, see Underwood, “Pioneering Minority Representation: Edward Roybal and the Los Angeles City Council, 1949–1962”: 399–425. For the relationship between Roybal and the city police during Roybal’s tenure on the city council see Escobar, “Bloody Christmas and the Irony of Police Professionalism”: 181–183. 13Underwood, “Process and Politics”: 167–170, 201, 215–221. 15See Underwood, “Process and Politics”: 254–258. 16“McDonough Will Run in New District,” 11 August 1961, Los Angeles Times: B1; “Know Your Candidates: McDonough, Roybal Tangle in 30th Dist.,” 19 October 1962, Los Angeles Times: A1. 17“Roybal Says Victory Backs Up Kennedy,” 8 November 1962, Los Angeles Times: 14. 18Meier, Mexican American Biographies: 199. After Roybal left, it was 23 years before another Hispanic legislator won election to Los Angeles’ city council. See Underwood, “Pioneering Minority Representation: Edward Roybal and the Los Angeles City Council, 1949–1962”: 424. 19Ralph Nader Congress Project, Citizens Look at Congress: Edward R. Roybal: 7. 20Quoted in Roger Smith, “25th Congressional District: Roybal Apparently Coasting in—Again,” 29 October 1980, Los Angeles Times: C9. See also Ralph Nader Congress Project, Citizens Look at Congress: Edward R. Roybal: 4, 7. 21“Roybal Recalls Prejudice inside Council, Congress”; Politics in America, 1990 (Washington, D.C.: Congressional Quarterly Inc., 1989): 170; Ramos, “Edward R. Roybal, 1916–2005: Pioneer in Latino Politics in Los Angeles.” See also Ralph Nader Congress Project, Citizens Look at Congress: Edward R. Roybal: 1. 22For more background, see “Roybal May Get Post He Seeks,” 13 January 1963, Los Angeles Times: 16. 23“Bracero Plan to Be Opposed by Rep. Roybal,” 10 January 1963, Los Angeles Times: 10. 24Hearing before the Senate Special Subcommittee on Bilingual Education of the Committee on Labor and Public Welfare, Bilingual Education, 90th Cong., 1st sess. (24 June 1967): 415. A record of the remainder of Roybal’s statement and the rest of the questioning that took place that day is on pp. 411–420. 25Elementary and Secondary Education Amendments of 1967, P.L. 90-247, 81 Stat. 783–820. For more on the bilingual education reform of the 1960s, see John D. Skrentny, The Minority Rights Revolution (Cambridge, MA: Harvard University Press, 2002): 179–229; and Ralph Nader Congress Project, Citizens Look at Congress: Edward R. Roybal: 16. 26Edward Roybal, “Bilingual? Si!,” 12 February 1981, Washington Post: A18. 27“Roybal Again Facing Cavnar in 30th District,” 26 October 1970, Los Angeles Times: C2; “13 Congressmen Seek Injunction to Halt War,” 26 May 1971, Los Angeles Times: A4; “Roybal Backs Chicano Viet Moratorium,” 25 August 1970, Los Angeles Times: A4. See also Ralph Nader Congress Project, Citizens Look at Congress: Edward R. Roybal: 5, 8–9. 30Ralph Nader Congress Project, Citizens Look at Congress: Edward R. Roybal: 1. 31The only one of the 242 bills that became law was H.R. 1367, a private relief measure, enacted on December 5, 1973. 32David Rodriguez, Latino National Political Coalitions: Struggles and Challenges (New York: Routledge, 2002): 65. 33“Carter Pledges More Jobs for Hispanics, Roybal Says,” 11 May 1978, Los Angeles Times: A2. 34Ellen Hume, “Progress Cited in Data on Hispanics,” 13 December 1978, Los Angeles Times: B12. 35Bill Boyarsky, “Latino Political Group Refuses to Endorse Roybal Reelection,” 16 February 1970, Los Angeles Times: 3. See also Ralph Nader Congress Project, Citizens Look at Congress: Edward R. Roybal: 1, 16. 36“Congressional Endorsements,” 27 October 1970, Los Angeles Times: B6. 37Rodriguez, Latino National Political Coalitions: 70; William Gildea, “An Evening for Hispanic Unity,” 18 October 1977, Washington Post: B4; “Roybal Heads New Latin Group,” 14 December 1975, Los Angeles Times: A35. 38Kenneth Reich, “Hispanics Plan Voter Registration Drive,” 5 August 1979, Los Angeles Times: A24; Lee May, “Citing Black Gains, Latino Group Sets Sights on Resources in Private Sector,” 21 September 1983, Los Angeles Times: B14; Jay Matthews, “Latino Politicians Urge Citizenship for Constituents,” 22 November 1986, Washington Post: A8. 40Ellen Hume, “Accused of Lying in Korean Probe,” 14 September 1978, Los Angeles Times: B1. 41Ellen Hume, “May Have Pocketed Cash, Roybal Says,” 14 September 1978, Los Angeles Times: 1. 42“Rare Full-House Censure of Roybal Recommended,” 27 September 1978, Los Angeles Times: A2. 43Charles R. Babcock, “Hispanics Assail Roybal Penalty,” 7 October 1978, Washington Post: A5; “Efforts Pressed to Ease Penalty on Rep. Roybal,” 12 October 1978, Washington Post: A3; Robert L. Jackson, “Groups Try to Soften Roybal Censure,” 13 October 1978, Los Angeles Times: B20. 44Some Members criticized the whole review process. Ronald V. Dellums of California, a member of the CBC, questioned the legitimacy of the Ethics Committee, pointing out that none of its Members were African American or Hispanic. Others in the Democratic Caucus believed Roybal’s lighter punishment indicated a retreat from Congress’s efforts to reform after the Watergate Scandal, just four years earlier. See Charles R. Babcock, “House Votes Reprimands for Roybal, McFall and Wilson,” 14 October 1978, Washington Post: A7; Thomas B. Edsall, “Democrats Back away on Penalties,” 7 December 1978, The Sun: A1. 45Roybal won more than 67 percent of the vote in the 1978 general election and nearly 70 percent of the vote in the 1980 general election. See “Election Statistics, 1920 to Present,” http://history.house.gov/institution/election-statistics/election-statistics/. 46Steven V. Roberts, “Roybal Digs in His Heels on Immigration,” 10 June 1984, New York Times: E3. 47For more on the early immigration debate, see CQ Almanac, 97th Congress, 1st Session, 1981 (Washington, D.C.: Congressional Quarterly, Inc., 1982): 422–424; CQ Almanac, 97th Congress, 2nd Session, 1982 (Washington, D.C.: Congressional Quarterly, Inc., 1983): 409; CQ Almanac, 98th Congress, 2nd Session, 1984 (Washington, D.C.: Congressional Quarterly, Inc., 1985): 229–238; Robert Pear, “Immigration and Politics,” 6 October 1983, New York Times: A1; James Fallows, “Immigration Bill Stirs up Melting Pot of Controversy,” 5 February 1984, Los Angeles Times: D1; “Immigration Compromise?” 15 February 1984, Los Angeles Times: C4. 48For the period between Roybal’s bill and the eventual passage of the Immigration Reform and Control Act of 1986, see Margaret Shapiro, “Hispanic Caucus Counters Bill on Aliens,” 2 February 1984, Washington Post: A4; Fallows, “Immigration Bill Stirs up Melting Pot of Controversy”; Margaret Shapiro, “Immigration Measure Produces Sharp Divisions in House Hispanic Caucus,” 18 March 1984, Washington Post: A2; Robert Pear, “Immigration Bill Is Hardly Home Free,” 8 April 1984, New York Times: E2; Roberts, “Roybal Digs in His Heels on Immigration”; Robert Pear, “The Hesitant House,” 8 May 1984, New York Times: A14; Spencer Rich, “House Chooses 29 Conferees on Immigration Legislation,” 7 September 1984, Washington Post: A9; Frank del Olmo, “Immigration Reform Claws at Fence,” 31 May 1985, Los Angeles Times: B5. See also Congressional Record, House, 99th Cong., 2nd sess. (3 October 1986): 28320–28324. 49The first quotation is from Mary McGrory, “Still Gripped by Fear,” 26 November 1987, Washington Post: 2; the second quotation is from Marcia Chambers, “Many Questions Aimed at New Alien Law,” 5 December 1986, New York Times: A21. For more on the law, see CQ Almanac, 99th Congress, 2nd Session, 1986 (Washington, D.C.: Congressional Quarterly, Inc., 1987): 61–67. 50“Keep Immigrants’ Families Together,” 4 April 1987, Chicago Tribune: 10. 51Ellen Hume, “2 Californians Will Chair House Panels on Children, the Elderly,” 24 November 1982, Los Angeles Times: B3. 52Hearing before the House Select Committee on Aging, Black Box of Home Care Quality, 99th Cong., 2nd sess. (29 July 1986). See also Victor Cohn, “Waiting for the Nurse to Show,” 14 October 1986, Washington Post: H8. 53CQ Almanac, 99th Congress, 1st Session, 1985 (Washington, D.C.: Congressional Quarterly, Inc., 1986): 330. 54The mail subsidies supported nonprofit organizations operating on limited budgets. Quoted in CQ Almanac, 99th Congress, 1st Session, 1985 (Washington, D.C.: Congressional Quarterly, Inc., 1986): 331. 55Quoted in CQ Almanac, 102nd Congress, 1st Session, 1991 (Washington, D.C.: Congressional Quarterly, Inc., 1992): 593. 57Dan Morgan, “Pride, Projects Drive Deal-Making on U.S. Spending,” 3 October 1989, Washington Post: A6. 58David Rogers, “Senate Approval of Last Spending Bills Clears Way for Budget Talks with House,” 2 October 1989, Wall Street Journal: A16. 61Congressional Record, Senate, 109th Cong., 1st sess. (27 October 2005): 24136. Oral History: In the Arthur L. Alarcon Interview, 1988, 394 pages. Subjects include Edward R. Roybal. Oral History: In the John E. Huerta Interview, 1990, 261 pages. Subjects include Edward R. Roybal. Oral History: In the Daniel M. Luevano Interview, 1988, 461 pages. Subjects include Edward R. Roybal. Oral History: In the Thomas M. Rees Interview, 1987, 388 pages. Subjects include Edward R. Roybal. Oral History: In the Richard Santillan Interview, 1989, 265 pages. Subjects include Edward R. Roybal. Oral History: In the Philip L. Soto Interview, 1988, 241 pages. Subjects include Edward R. Roybal. Oral History: In the Hope Mendoza Schechter Interview, 1977-1978, 170 pages. Other authors include Edward R. Roybal. Papers: 1953-1962, 25.5 linear feet. The collection consists of manuscripts, correspondence, notes, photographs, and printed material related to the career of Edward Ross Roybal as a Los Angeles City Councilman. A finding aid is available in the repository and online. Papers: In the California Democratic Council Papers, ca. 1952-1967, 7 feet. Subjects include Edward R. Roybal. "Edward R. Roybal" in Hispanic Americans in Congress, 1822-2012. Prepared under the direction of the Committee on House Administration by the Office of the Historian and the Office of the Clerk, U.S. House of Representatives. Washington: Government Printing Office, 2012. Ralph Nader Congress Project. Citizens Look at Congress: Edward R. Roybal, Democratic Representative from California. Washington, D. C.: Grossman Publishers, 1972. Underwood, Katherine. "Process and Politics: Multiracial Electoral Coalition Building and Representation in Los Angeles' Ninth District, 1949-1962." Ph.D. diss., University of California, San Diego, 1992. Wheelock, Warren and J. O. "Rocky" Maynes, Jr. Henry B. González, Greater Justice for All; Trini Lopez, the Latin Sound; Edward Roybal, Awaken the Sleeping Giant. Consultants, Jorge Valdivieso, Amalia Pérez, Fabiola Franco. St. Paul: EMC Corp., 1976.